Various Artists - VENEZUELA 70 Vol.2 - Cosmic Visions Of A Latin American Earth: Venezuelan Rock In The 1970s & Beyond. Vinyl LP, CD. Bleep. 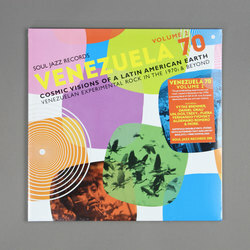 Two years on from the superb first volume of their Venezuela 70 series, Soul Jazz Records come through with a second helping. Cosmic Visions Of A Latin American Earth II is another hot-wired collection of the most forward-thinking rock music to emerge from Venezuela during the 1970s. Styles as far-flung as disco, prog, Latin jazz, psych-rock and more are all bent into innovative new shapes across these eighteen tracks.